Please bear with me as I bring you even more photos of the outdoor caterpillar hotel occupying what's left of the parsely in the veggie garden. They are fast growing little fellows. 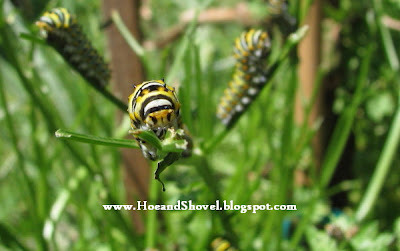 There are more of the first stage instars and cats of all sizes but mostly older ones now. Hopefully they are not going to eat their way out of food supply. The parsley WAS looking very full and ready for dining when the eggs were first laid. Now these big fellows are eating stems and all. I find myself walking over to the veggie garden several times a day to check on all the babies. Every single time they are doing the same thing. Eating or sleeping. And the birds haven't found them... yay. I marvel at their tenacity and rythmic ways. And finally I've spotted a brown chrysalis. ... and a green one, too. 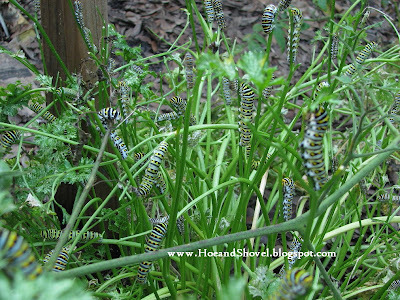 Our's ate ALL the parsley, including the stems.We're still on the hunt for a chrysallis. Nom nom, nom, nom....I hear the little darlin's amunching away...so glad to see them, Meems, I'm grinning from ear to ear with you. Wow that is a lot of cats on such small plants! Wait until the males emerge and hang around waiting for the females to emerge. One year I had like 15 adults in the garden. About 10 males fought with each other then the most dominate one mated the females BEFORE they ever flew yet. I have maybe 10 right now and one chrysalis. My bronze fennel could support maybe a 1000 cats. I've never seen so many at one time! Wow! If your grandchildren live nearby, you could bring some of them into the house to watch up close and personal. I do this each year just for myself. It is so amazing to watch! My favorite part is holding the butterflies and releasing them outside. My gosh! 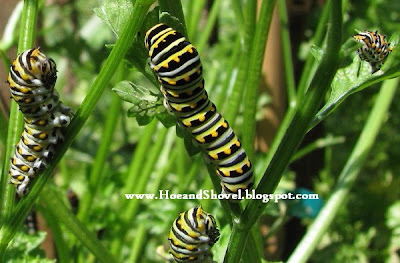 I search for even one caterpillar on my butterfly weed and never see one! How fun it must be to watch the show! Wow...this is so cool, Meems. 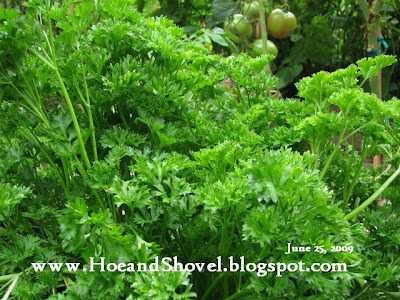 Next year I'm planting parsley so I don't miss out on all this good fun! Meems, I have never seen so many on a plant.It is amazing to think that something like that will turn into such beautiful flying flowers. 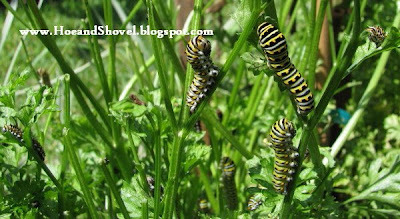 WOW, I have never seen so many black swallowtail caterpillars in one place at one time. Something always eat ours before they can get very big. I hope you get lots of them to hatch in your garden. That is so neat! I've never seen anything like that before. I'd be checking all the time too. It's totally amazing how many you have, Meems. I can't wait to see more.... WOW---it's just too exciting. Meems, that is SO neat to find a chrysalis! I've had cats often, but I've never seen a chrysalis. I did have a just "hatched" black tiger crawl on my porch to dry and sun herself, but that's the closest I've come. I look forward to more photos and stories about your cats. I've left some carrots in the ground just to let my grandson pull them. He loves to pull them out. They are very healthy looking but they are a bit on bitter side from the heat. I had not planned to eat them. So this morning I moved over a dozen of the bigger cats to the carrots which are located two beds away from the parsley. Lo and behold there were already a few chomping away on the carrots stems. Now they have company. This caterpillar nursing is important stuff. 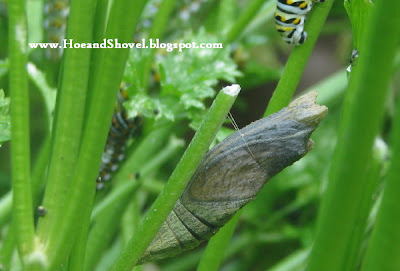 :-)Oh, and I found another Chrysalis and a last stage cat attached to a trellis rod turning into on... oh, so exciting. you have your own little nursery going on in your garden. that is amazing looking. i don't think i have ever seen such a thing with so many caterpillars and such. 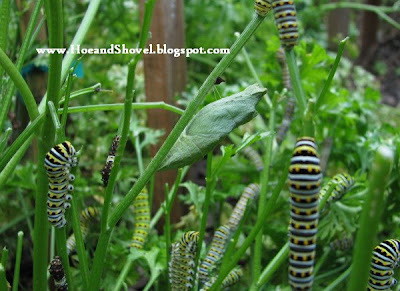 i wonder what it will be like when they start to emerge...you will have to keep us updated. how much fun that must be daily checking on these little guys. Oh my! I'm so glad I saw this post of yours Meems. How fantastic to have so many swallowtail (??) caterpillars. I hope they don't eat themselves out of food too. Maybe since you've found several chrysalis, they're all about to turn??? I would be beside myself if I had so many in my garden. I hope they all successfully make the transformation. 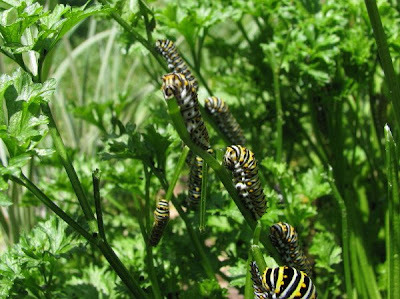 I planted parsley this year in my garden in hopes of getting some caterpillars. My bronze fennel has never attracted them and I'm not sure why? Funny where they decide to lay eggs. They must have known you would look out for them very carefully. I guess if you got desperate you could buy them more parsley plants???? I'll be back to check on them too! 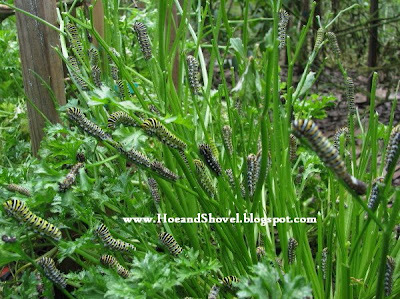 They also love fennel...I grow it just for them.